Here are some of my tips as to how to get a grip on your next trackday. Most modern-day, general-use sports tyres have enough grip for a trackday, even on a 1000. Even sports touring rubber is fine, especially in the cold and damp. Even Ron Haslam uses sports- touring rubber at his race school. Strangely, most riders don’t use dedicated trackday tyres, but they’re best for the job. All the main tyre companies make them. They look like race tyres, with big balloon profiles for fast steering and side grip. But the compound is friendlier and more manageable and they don’t need tyre warmers. At best a race tyre will be about a second faster a lap than a good trackday tyre. That isn’t worth it given how fickle they are. Race rubber will need to suit the track conditions perfectly, need tyre warmers and will degrade after too many heat cycles. They won’t heat up quickly on a cold track either. You’d be surprised what tyres people use on a trackday. At the one extreme you have the race tyre brigade and the other the: ‘ignorance is bliss’ lot. They’ll be on miss-matched, squared-off tyres and usually end up in the gravel. Road pressures are too high for the circuit. Fronts can go as low as 31psi and rears from 30-31psi, depending on the make and model of tyre. You can fine-tune pressures: less air gives you a bigger contact patch, more grip, but less stability. More air: better stability, faster steering, but less grip. Remember to change them back for the road. Trackday tyres don’t need special suspension settings by themselves but the fact they’re giving you the grip to go faster means you’ll be loading the suspension more. You’ll need to adjust preload and damping for more control and support and if tyres have different diameters to standard you’ll need to adjust ride height and traction control settings. 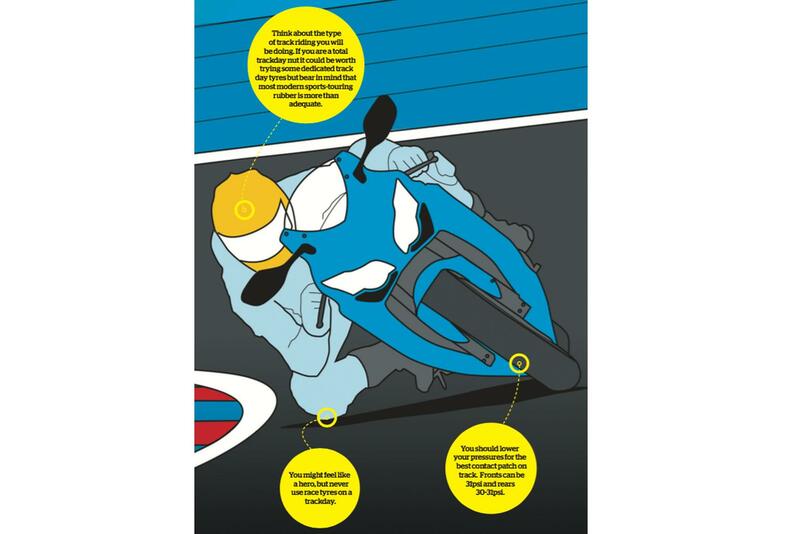 If you like riding in the rain, wets have incredible grip, but don’t bother with tyre warmers. Check recommended pressures – too soft and the tread blocks squidge together and the tyre can’t disperse water.